Biologicals and BMPs – A Modern Digester’s Blueprint for success? It’s the 10th Century BC, and you walk into one of several heated baths in the Assyrian Empire’s capital after a long hot day. In the 16th Century AD you do the same with Persian Baths. In Victorian London, you find yourself walking along the streets of a lighted London. What do these events in history have in common? They all utilize that same source of energy, one of the oldest and most renewable sources of energy – biogas from anaerobic digestion. Even without technological advances or engineering marvels, these baths of Persia, Assyria, and others, as well as the lighted lamps of Victorian London all operated efficiently and without fail. Of the more common renewable energy sources, biogas is one of the oldest and the most sustainable, because it functions because of hundreds of thousands and millions of employees working just for food and bed. These employees, which we cannot see with the naked eye, we did not even fully understand (and still even do not fully understand or appreciate). 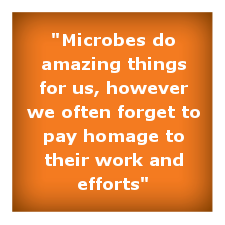 These microbes do amazing things for us, however we often forget to pay homage to their work and efforts. The anaerobic digestive process, unlike most any other energy producing process relies upon a workforce we do not see. These microbes consist of bacteria and methanogens working hand in hand to achieve the best results they can. They work together as a tight fit network of employees, aiming for perfection. In their world, perfection is making the most available food sources accessible for the next in their assembly line. 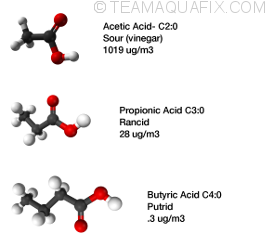 To give equally for what they take, the bacteria work to break down carbon compounds into lower fatty acid chains, these lower fatty acid chains we call volatile fatty acids, are the ones that methanogens use to convert, with hydrogen, into methane gas. Along with producing low chain carbons, many of these bacteria also produce a waste product of either hydrogen or more complex carbon dioxide gas. Methanogens use these volatile fatty acids and even carbon dioxide as food sources, and the hydrogen as an energy source as they devour these and produce methane gas in combination with other gases that were produced by other bacteria. By ensuring we have the right bacteria to work in conjecture with our friendly neighborhood methanogens we can achieve higher than anticipated yields. Ever wonder why some digesters thrive at 75% methane and other stumble and struggle at 40%? Yes, engineering does have a part to play in this, but not as significantly as you may think. Biology is equally important for setting the groundwork for good output. Knowing which biology works best for the feedstocks you have is a vital component to your success. To figure out which biology works best, without impairing or risking the success of your current production we are called to utilize BioChemical Methane Potential test Systems (BMPs), methods by which we can simulate our exact criteria: our mixing timings and speeds, our operating temperatures, and even using the exact feedstocks makes a difference as the naturally occurring biology is different in one region from another. We may find strong sulfate-consuming bacteria as a part of a recipe in sulfur rich water regions, but find more aggressive, hungry carbon munchers like Clostridium in another region. It is so important to use what you naturally have and find a complement to help it work more effectively. To do this we may find that simple biocatalysts that stimulate current biology may be enough, other times we may find the need for introducing additional bacteria to help break down those longer chain fatty acids. Whatever the solution, in the era in which we live, there are plenty of options and plenty of opportunities to find the right solutions. It may take 10 tries, maybe 20 tries, but if we are patient and continue to pound at it, we will find the solutions that fit for our digesters. Technology has advanced over the millennium since anaerobic digestion was first introduced into the world of man, but it has only been recently with our growth of understanding of the microbial world, that we have grown to understand the use of outside microbial additives (whether that be simply microbial additives themselves, or a media to promote a healthier microbial atmosphere, or even a combination of both). This understanding of the microbial world is new, even our understanding of the microbes themselves is still evolving. Its only been in the last couple decades that we understood that Archaea (the class of organisms that methanogens belong to) are not even a true bacteria. The world went through its technical revolution and is now entering what one could refer to as the microbial revolution. Where once we thought everything needed to be steamed and made void of biology, we now understand some of these biological entities are our friends. This friendship extends to our energy production within anaerobic digestion. We often mistakenly assume that this biology will evolve to suit our needs, forgetting that these organisms, like ourselves, are subject to specific living conditions and that going outside of those conditions creates a toxic environment. That overloading with metals or minerals can equally become as toxic to these bacteria and Archaea that we rely upon as our workforce, as it can be upon ourselves. These digesters can obtain upset stomachs and upset biology just as we do. Just as occasionally we are required to watch our diet, we need to do the same for our digesters. Finally just as happens, when we cannot watch our dietary intake, we sometimes need to inoculate our food intake with minerals, vitamins and even probiotics (foreign bacteria meant to help force our stomachs to a balanced condition), so too we sometimes, in fact more often than not, must inoculate these digesters we invest in with bacteria friendly to the food sources we are in taking to allow it to simply break down into a more friendly condition so that our friendly methanogens can more readily consume, leaving us with our desired CH4 gas output in as high of a percentage of our overall gas as is possible. To understand this process let’s start from the back end and work our way frontwards to the start. In the end we wish to see methane gas, in as high as possible a form in our total biogas. We know from research and practical application both that we can see 70% CH4 or, on occasion, higher in a healthy digester system, as was described earlier. So how do we get there? How do we get to the Holy Grail that we all know is possible but struggle so aimlessly to acquire? The thing to understand is this: methane gas is produced by methanogens, and methanogens prefer fatty acid chains that are 1-6 carbons in length; they prefer simple foods, and not complicated ones. 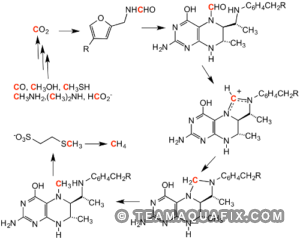 These fatty acids are known as volatile fatty acids. For this to occur, in enter our trusty bacteria friends. 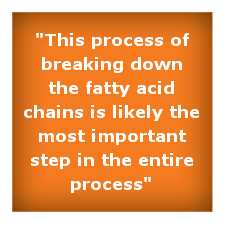 As much as any process, this process of breaking down the fatty acid chains is likely the most important step in the entire process. To break down these mid- to long-chain and even very long-chain fatty acids into simpler fatty acid chains that the methanogens can consume is a key for every digester’s efficiency. Whether we break down these chains using ultra-sonic or other mechanical methodologies, or spend our resources working on ensuring the right biology to do this is present, or even a combination of the two, this is the key stage for an anaerobic digester’s productivity. How well these fatty acid chains get broken down into more amiable forms is what allows a digester to be successful (in terms of productiveness). So how can we find out what is the right bacterial balance for my digester? The simplest thing to do is to perform side by side BMP analysis utilizing your standard operational procedure and typical feedstocks, against potential biological additives offered in the industry. In this manner one can dictate the production capabilities of their digester with and without these biological additives, truly answering for themselves whether or not these additives are worth the cost, time, and effort. Do these additives result in enough of an increase to justify those costs? In this writer’s experience, I have yet to see a situation where we did not find a product that was the perfect solution to far exceed their current production levels. In some cases these increases were to the magnitude of a 200% increase. In others it was a meager 30% increase in production. Regardless of those, this writer has yet to see a situation where biological additives have not increased a digester’s production. In over 20 digester simulations, we have seen increases 100% of the time over the standard input. Don’t take my word for it, test it. But don’t just test one, find about a dozen to test against, and find that perfect additive for your digester system! 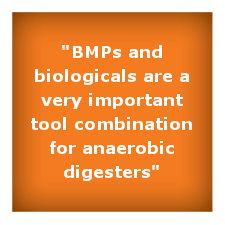 BMPs and biologicals are a very important tool combination for anaerobic digesters. Many debate the efficiency of BMP work as being typically 25-30% of, but the reality is in the way the BMP work is completed. If it uses a biological inoculant that the digester is not utilizing, then the overall results can easily be 25% or even 50% off. Typically when we start a BMP test we find a suitable seed material to use to kick start the trials. When we start up an anaerobic digester we rely on what is naturally there to do its job. The problem is right there, naturally occurring versus optimization. When we rely on present microbial populations that are inert in the materials we are getting what we get. Sort of like looking at a crowd of people, each with a random number, and we pick a number out of a hat, and the person with the correlating number races for us. First we are gambling that s/he has the speed necessary, what about the athletic conditioning? More important, what if that person does not want to run? Now repeat that same selection protocol, except you are at an Olympic stadium watching the runners. You get to select which one(s) that you think would be best based on their performance and you pick that person. So, whose runner will likely win? The random joe picked from the audience? Or the professional athlete? This is the same with anaerobic digestion. If we rely on what we get, then we must believe that the biology we want may not be there. Anaerobic digestion is a multi-step process: weakening of long fatty acid strands in the hydrolysis stage, then bacteria break that down and make it more available for the methanogens. Finally, the last stage is when the methanogens take that feed source and finish it off, making methane from the available fatty acids (commonly referred to as volatile fatty acids). 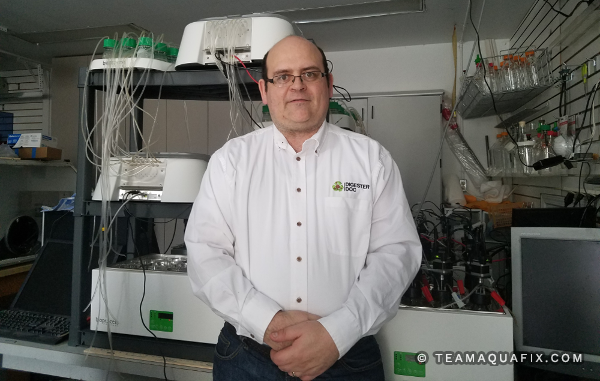 If we do not find the best possible bacteria that can aggressively target those specific fatty acid chains in our feedstock, then we leave carbon compounds with longer fatty acid chains, and we will not be able to break those down efficiently. Why are BMP results so different than actual real life results? This is a question you have likely had or seen raised by others. If you seed your digester only once, then over time you lose the benefits of the introduced bacteria, as these populations either wither away or are diluted to non-existence. A BMP a batch reactor, working under the assumption that you feed your digester the same constantly. When you’re a farmer do you fertilize your soil once and that’s it forever? If you receive a medical doctorate degree do you stop learning the new advances in medicine? Why as digester operators would we want to stop after only one treatment? Usually we “seed” our digesters and feel that is sufficient, but gradually over just a short time the effects go away. We lose those benefits. If they are not replenished, then like fertilizer in the soil, they wane and eventually disappear. And when that happens the fruits of our efforts are not fully realized. We miss optimizing our labor and productivity. Remember: soil needs to be fertilized, a medical professional never stops learning, an athlete never stops training. We should be no different, fertilize your digester with the right blends of nutrients and metals. Make sure your staff is well enough educated to look for the red flags and to know the yellow flags when they first start to appear. And ensure you always keep your digester well trained and in top mechanical condition. Make sure your digester is working to its best ability; don’t shortchange your success by limiting your digester’s biological capability to fully process all that carbon into energy. Your biology is 1/3 your success. As everyone knows in business the difference between the red and the black can sometimes be as small as a 10% factor. So why throw 33% away and run with 33% or 66% of your digester project’s efficiency? A final way to look at this is that you start with 100% carbon, and the amount of carbon that is immediately volatile is what is typically “convertible” carbon to methane, but the remaining carbon that is in longer chains can have a portion of that broken down to be made available and readily consumed by our methanogens. The percentage of the remaining carbon that becomes available, or volatile, is up to you, and up to the amount of work you put in to finding the right biology to take your digester to a brand-new level of success. Where there is a will, there is a way, find the will to succeed by applying the sciences and technologies available to us today to your digester’s successful operations. Together, we can uncover the mystery of the black box one microbe and one digester at a time!